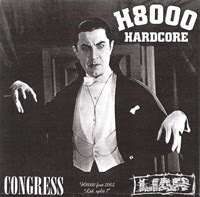 Here's a pretty sweet H8000 record, the split 7" between arguably the 2 most well-known H8000 bands, Congress & Liar. It was given out at the 2002 edition of the H8000 Fest, in a limited run of 500 copies. This handing out of a free record happened at all the H8000 Fests (1994, 2002, 2003 & 2007). Hans Liar wrote up a post with some more information on it on his blog, so check that out if you want more info. The result is an awesome split 7", with the Liar side as my personal fave, but the Congress track is also great. As mentioned in Hans' post, both tracks would later be re-recorded by the bands. I also have the compilation 7"s that were handed out at the 2003 & 2007 editions of the H8000 Fest, I might post those at some point if there's a demand for them. Essential indeed, I have the testpress! I'm thinking about posting some rare but crucial stuff myself! Damn, I was beginning to think no one in the US even owned one of these. I need a copy!!! oh yeah, post the other 7"s, please!